The master's programme focuses on advanced, already research-related courses in the subjects of inorganic, organic and physical chemistry, as well as in the subjects surrounding the department’s main research areas, especially life sciences and material sciences. You choose one subject of specialisation from the three major subjects: inorganic, organic and physical chemistry. As electives we offer analytical chemistry, biochemistry, chemical material sciences, geochemistry and environmental chemistry, theoretical chemistry, industrial chemistry as well as fields of study from biology, computer science, mathematics and physics. As a graduate you will have acquired a qualification profile that is relevant to modern research. If you wish to deepen your scientific knowledge and skills, you will be qualified to take up doctoral studies. Why study Chemistry at Konstanz? The courses of the Master's Programme in Chemistry are research-oriented and allow you to participate in current research projects. Our courses are designed with an interdisciplinarity in mind that will help reduce the barriers between the traditional subjects of chemistry (inorganic, organic and physical chemistry). You can specialise within the master's programme according to your individual interests. For a senior position in research and development a doctorate is usually required. Above-average students can take the Fast Track option with direct admission to doctoral studies, thus shortening the overall study period. You do not have to complete an internship outside the university. A period of study abroad is always highly recommended. The university promotes study abroad via the Erasmus+ and numerous other exchange programmes. You do not have to proof any foreign language skills for the master's programme. However, as large parts of the research literature are written in English, good English skills are highly recommended. Languages of instruction are German and English. Above-average university degree (bachelor) in chemistry or a related subject with clear links to chemistry. International applicants need documentation of their German language skills, level DSH-2 or TestDaF 4, or a language test recognised as equivalent. Please contact our International Office for more information. 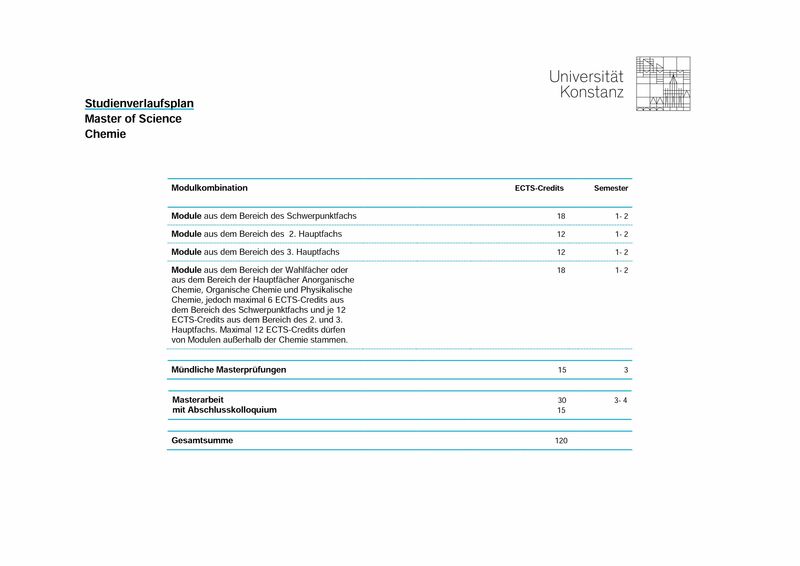 Once a year, the University of Konstanz grants exemptions to a limited number of particularly gifted international degree-seeking students in accordance with the Begabtenbefreiuungssatzung (statutes governing the exemption of gifted students). You can find more information here. Admission to the Master's Programme in Chemistry is not restricted. An application is possible during the following period: 14.5. - 15.6. (winter semester) and 3.12. - 15.1. (summer semester). There may be other deadlines if you are applying for admission to a higher semester (for instance, if you are changing subjects or universities). For more information please consult the university website. Documentation of your academic degree including details on course work. If you have not received your degree certificate by the end of the application deadline, please attach documentation of all your examination results so far. Current certificate of enrolment or proof of exmatriculation (if you have studied at a German university, please indicate your 'Fachsemester’ and ‘Hochschulsemester’). A study programme with excellent prospects: develop your own clear professional profile and enjoy studying in close proximity to research.